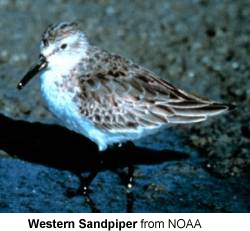 The Western Sandpiper, Calidris or Erolia mauri, is a very small shorebird. Adults have dark legs and a short thin dark bill, thinner at the tip. The body is brown on top and white underneath. They are reddish-brown on the crown. This bird can be difficult to distinguish from other similar tiny shorebirds, especially the Semipalmated Sandpiper. This is particularly the case in winter plumage, when both species are plain gray. The Western Sandpiper acquires winter plumage much earlier in the autumn than the Semipalmated Sandpiper. Their breeding habitat is on tundra in eastern Siberia and Alaska. They nest on the ground usually under some vegetation. The male makes several scrapes; the female selects one and lays 3 to 5 eggs. Both parents incubate; the female may leave before the eggs hatch. The male and sometimes the female look after the young, who feed themselves. They migrate to both coasts of North America and South America. It is a very rare vagrant to western Europe. These birds forage on mudflats by probing or picking up food by sight. They mainly eat insects, small crustaceans and mollusks. This is the most abundant shorebird in western North America with a population in the millions. The numbers of this bird may be declining due to pollution and other factors at a few critical stopover locations used during migration.